This is something which councillor Rod Clark feels has overshadowed the process. While it did not amount to a legal conflict of interest, Clark says, “morally and ethically? It stinks.” In response to council’s decision to hold another hearing in the New Year, Onni is blaming Clark and fellow councilor Pam Bookham for holding back the approval. What has often been omitted in coverage of these recent developments, however, is a more in-depth look at what the councilors had actually spoken out against, and why. Councillor Clark had previously been on the record as saying that a public hearing held on November 19th had been “hijacked” by the development company. He explains that Onni had signed up four pages of supporters when the sign-up sheet came out at 4:30pm. “So obviously we didn’t get a correct impression, at least for the first three or four pages of what the community had to say,” he says. According to Councillor Bookham, the city website had stated that the sign-up time for the public hearing was at 5:00pm, but that in fact the city had posted the sign-up sheet half an hour earlier without changing the website instructions. This meant that the supporters rounded up by Onni were given an additional half-hour to put their names down, or have their names put down by Onni from a “pre-arranged list,” according to Toni Bolton of North Van City Voices. With many community members signing up to speak, the hearing ran until 12:45 am. Towards the end, it became clear that many who had signed up were unable to speak. “I know for a fact that at least 22 names were called from the list and the person did not respond,” Bookham says. According to the North Shore Outlook, the meeting ultimately saw 65 speakers in support of the development and 21 against. On the other hand, Clark says that, “You know, people who have to get up to work, or who maybe are elderly, or whatever, go home. For Onni to claim that that was a proper and due process was totally incorrect, as far as I’m concerned”. Ultimately a majority of city councilors voted to hold another meeting in the New Year, which seems to have triggered Onni’s letter of withdrawal. Bookham has responded that multiple public hearings can be the norm for large projects. “[T]his is not unprecedented,” Bookham says, referring to a development at 612 Chesterfield where the developer had to go through a second hearing before choosing to scale back the project, rather than go through a third public hearing. What comes through resoundingly in the letter is that De Cottiis is tired of all the public consultation, and that he is “unwilling to continue to go to endless rounds of public hearings until Councillors Bookham and Clark get their way.” In fact, the hearing on November 19th has been the only official city-run public hearing, preceded by one town hall meeting in July. The rest have been developer-hosted public engagement events, including meetings with business associations and residents of The Grande, a residential building nearby. The Onni development currently proposed has had its fair share of controversy. The North Vancouver Official Community Plan (OCP) has a density limit of 2.6, whereas the proposed project would double that density. The highest tower of the two currently planned by the proposal measures 240 feet, 60 feet higher than the OCP limit, according to Bookham. She also claims that the OCP encourages pedestrian-friendly design, where buildings are generally set back from the property line to maximize space for pedestrians, which is not the case with this development. Other issues concern the traffic brought on by added density, as the proposed development is already located between two major routes for emergency vehicles, and would put pressure on 14th street, which is currently pedestrian-oriented. This is further complicated by the presence of delivery vehicles to the Safeway on the ground level of the development. Community members are also concerned that nearby park, Stella Jo Dean Plaza, will be obscured by the towers’ shadow, and that the green space included in the proposal is only intended for private use. The loss of amenities potentially provided by the development have been a major point of discussion, over which De Cottiis expresses regret in his letter. 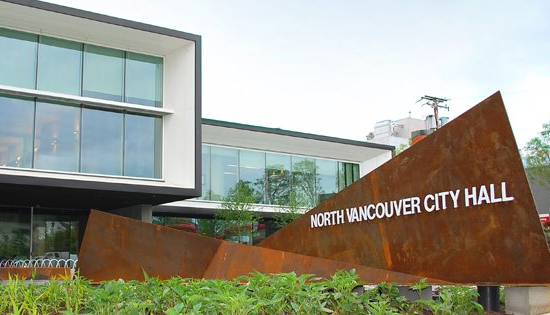 These include a direct contribution to the city amenity fund of one million, a 37 spot daycare facility with an estimated value of 5.3 million, and 10,000 square feet of affordable housing which could range from 10-15 units depending on their size. Some residents, however, such as Ms. Nichol and Ms. McEwan, expressed in the public hearing that the spaces provided for affordable housing and a 37 spot daycare are not enough to fit the community’s needs. Bookham says that she feels that the city could make more use of the amenities. “It would be better to take the cash and locate [them] off the site, where we can actually secure more units and more daycare space,” she says. Instead of having the affordable housing in the development, for instance, the money could be used to purchase space in wood frame buildings, which are less expensive, or to purchase a building outright. “I want to make sure that we’re going to get the best benefit in those areas, if that’s what we want to target as the aim of the additional density, then lets make sure we make an arrangement that will give us the best return for the density that we are accommodating,” Bookham says. Ironically, Onni has now sent another letter to Mayor Mussatto accusing Clark of a “conflict of interest,” because Clark is employed by Whitewater Concrete, a concrete services construction company currently subcontracted by an Onni job site. Onni spokesperson Beau Jarvis told CKNW on Monday that, when in doubt, members of council should “err on the side of caution and declare any real or perceived conflict of interest.” Yet, it seems this principle has not been applied to the campaign donations given to city councilors and mayor. Further, Bookham believes that Onni’s withdrawal is more complicated than it appears, suggesting that they may be trying to “save face,” by blaming comments of councilors for the withdrawal. The reasons for withdrawal may be partially financial. “It may not be in their best interests right now to see this project through,” she says. Bookham notes that Onni has still not officially withdrawn their application, as they said they would do within 72 hours. This leaves council in a tough place, waiting for a definite answer from Onni, who may use their current position as a bargaining tool. Posted in Analysis, City Hall, Interview, Uncategorized. Bookmark the permalink. It may also be worth noting that starting on December 7th, Onni ran full page ads in the North Shore News claiming they had withdrawn from the project and blamed Councillor Bookham for “shameful behaviour”. The public hearing on November 19th deviated from the usual process in several ways. Onni’s bullying behaviour has continued and this is a very unfortunate situation for all involved. They have yet to “withdraw” from the project. I thought you said North Van City Voices has not taken a position on Onni’s development proposal. Below is a quote from a letter written by you as a representative of the vocal minority organization. · Voices has not adopted a position on the Onni proposal. Some individual residents who are members of Voices are opposed to the proposal as currently structured, and have expressed their concerns through the normal channels – letters and emails to councillors, petitions, speaking at public hearings etc. – but on their own behalf, not as representatives of Voices. We have not met with any councillors on this matter. Has North Van City Voices taken a position or not? A simple yes or no will suffice. Your unbalanced reporting needs improvement. Let me help you. Let’s start with a quote from your article, “Yet, it seems this principle has not been applied to the campaign donations given to city councilors and mayor.” RPMG’s contributions to certain councillors’ campaigns were publicly disclosed. Mr. Jarvis’ only suggested Councillor Cark should also have disclosed his employment circumstance given he may have harboured ill will towards the company. Not every flag person is necessarily happy with their work. I can only conclude you do not grasp the principle of disclosure. In addition, Fred Dawkins and Joan Peters, members of North Van City Voices, which is a vocal minority group vehemently against the development (http://wflbc.com/2012/12/11/north-vancouver-nimbys-playing-politics-and-taking-control/), also made similar donations; Ms. Bookham being a beneficiary. Should not such councillors also then recuse themselves from the process? With respect to calling for a second public hearing, Ms. Bookham”s sincerity and intentions must be called into question. Shortly after the first public hearing Ms. Bookham circulated an email to fellow councillors and City staff outlining what she wanted to see incorporated into the development. If she was seriously concerned about what the public had to say and the interests of her constituents, should she not have listened to them first before trying to hammer out a deal that represented her own interests? If you do not believe me, ask Ms. Bookham, on the record, if such an email exists. Trust me, I have seen it. You also should be aware that certain members of the opposition also signed up individuals at the first public hearing who supported their cause including a former councillor. Mail order journalism degrees do not make recipients journalists. Asking for Clark to declare a “conflict of interest” is so much more than saying he should have disclosed that information. It would require him not to be involved in voting related to the Onni development. Dear Richard Parker (or whoever you may be); Glad to see we’re helping you keep up to date by checking on postings on our website. Your comment “Mr Jarvis only suggested …” he actually said he was starting legal proceedings, hardly “suggesting”. Donations from individuals are not the same as large developers donations, thus causing people to wonder what the developers may be expecting in return. Also the email from Councillor Bookham -you indicate that it was sent to fellow Council members, and was not made public – therefore you could only have seen it if another Councillor passed it to you. The two individuals signed up in advance by “the opposition” were both over 80 years old and former City Councillors.